Bonus! Page Border / Frame in Color - Add to your own Puzzle-oriented materials! 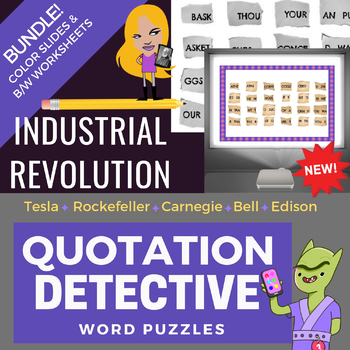 INDUSTRIAL REVOLUTION: This bundle of word scramble puzzles are a unique way to enhance or complete an Industrial Revolution unit. Quotes by Industrial Revolution inventors and industrialists such as Rockefeller, Carnegie, Tesla, Bell and Edison are included in this unit. Both worksheets and slides are in this bundle. 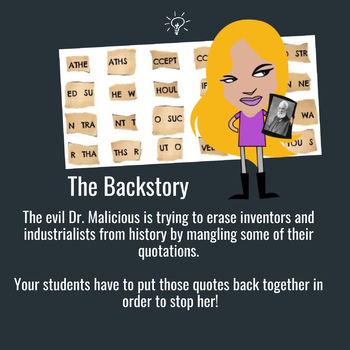 Quotes from Industrial Revolution industrialists and inventors are jumbled up --- they look like torn pieces of paper. Your students are challenged to re-arrange the words into the original quotation. There's a grid they can fill out in the worksheet versions , so no other paper is needed and it helps keep students' eyes on the same worksheet page as the word scramble. On the answer page for each puzzle, there's interesting facts about these Industrial Revolution figures so you can make it into a lesson! With both a worksheet and a slide, you get maximum flexibility. You can use these as an introduction to your unit on the Industrial Revolution, as a review before a test, or simply as bell ringer activities for your early finishers. Color slides: Project onto a whiteboard and let the whole class solve it together with one student representative writing on the board. Often, different students will be able to fit together different pieces of the quotation, making this a bonding teamwork activity for the entire class! 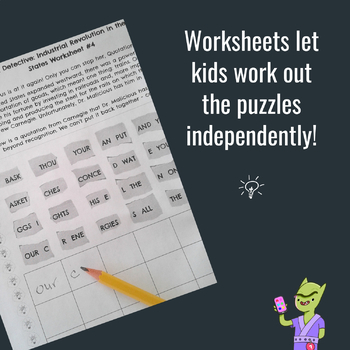 Worksheet activities: Print it out easily and hand it out! A grid is included on each page, so students can work out the quote right there on the page independently.